After a long and rather exhausting summer of travel across Europe and Asia, I was once again craving a luxurious return journey to bring me home. And having already flown in the fancy seats with Lufthansa, Japan Airlines, ANA, and Cathay Pacific, I was eager to try something new and check another airline off my First Class bucket list. After some shopping around, I decided to book a one-way First Class ticket with Asiana Airlines on their Airbus A380 for 105,000 Aeroplan miles per person. 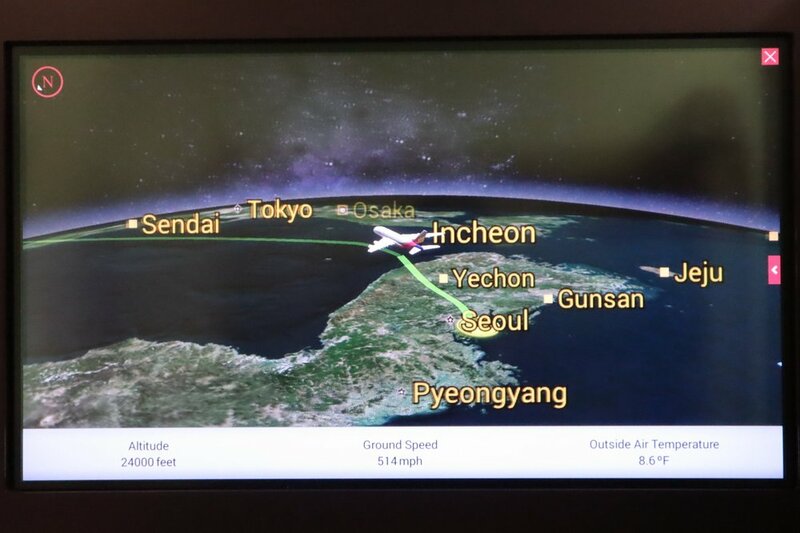 Award availability was quite easy to find on the Seoul–Los Angeles route, and the fuel surcharges were very reasonable as well, so overall this was one of the easier First Class products to book. If you enjoyed the video, make sure to give it a “Like”, leave a comment, share it in your circles, and subscribe to the channel for more videos in the future. I was among the first passengers to board the beautiful double-decker plane through the forward door on the lower level. My boarding pass was inspected by a crew member, who warmly welcomed me to First Class and led me towards my seat. Following her, I turned right along the first aisle to access the First Class cabin. First Class on the Asiana A380 is located at the front of the lower level of the plane, with the economy class cabin positioned immediately behind it. Meanwhile, business class occupies most of the upper deck, with a smaller economy class cabin located upstairs as well. The First Class cabin consists of 12 individual enclosed suites, arranged in a 1-2-1 configuration across three rows. Compared to the First Class products I’ve tried previously (which mostly featured eight seats or fewer), this was certainly a less intimate cabin, but with the sheer size of the Airbus A380 it didn’t feel cramped at all. Walking into the cabin, the sleek bronze finishes of the seat walls give the First Class space a streamlined, modern look. In terms of design, it leaves an excellent first impression. Jessica and I had been assigned two window seats along the left side of the plane. I arrived at Seat 3A in the corner of the cabin, with Jessica taking up residence in 2A in front of me. Waiting at my seat were the amenity kit, headphones, and slippers for the flight ahead. For solo travellers, I’d recommend picking one of the window seats, since the generous curvature of the A380 aircraft makes your suite feel quite a bit more spacious than those along the middle. Meanwhile, for couples travelling together, picking the two neighbouring seats in the middle certainly has its advantages as well – as I’ll expand upon later. While I loved the polished look of the exterior “walls” of the suite, I thought the interior design was a little uninspiring. Yellow and white accents on a dull beige upholstery just doesn’t quite do it for me, and I thought Asiana could’ve earned major style points by building upon the modern look of the suite exterior with, say, a darker palette for the seat and a few pops of colour for contrast. As usual, I took the time to fiddle around with the wealth of in-seat features. The first thing to note about the enclosed suite is that the doors aren’t automated by any means; instead, they’re meant to be opened and closed by hand, and it takes quite a bit of elbow grease to get them to budge. Obviously, they’re left stowed and latched for taxi, take-off, and landing, and only meant to be closed during the flight. As you take your seat, you find the enormous 32‘’ entertainment screen in front of you. Underneath is a spacious ottoman, which comes with a seat belt, thus doubling up as a buddy seat in case you want to hang out or enjoy a meal face-to-face during the flight with your travel companion. The ottoman also forms the foot of the bed when the seat is put into lie-flat mode for sleeping. Underneath the ottoman is a space large enough to store a standard carry-on. The First Class cabin on the Asiana A380 doesn’t have overhead bins, and this contributes to a more airy atmosphere, but also means that your carry-on luggage must go under the ottoman in front of you. On the aisle side, you’ll find a small storage compartment built into the walls, in which you can store your coats and garments. A coat hanger is provided. Meanwhile, on the other side, the surface space running along the length of the suite can be opened to reveal a series of nooks and crannies. First off, a simple medium-sized storage compartment is positioned at the very front. Next, you have the tray table, which pops out of its holder with the click of a button and then folds downwards into position. The tray table is pretty huge, and can slide back and forth freely along the axis of the suite. Closer to the seat, there’s a wooden panel that lifts to reveal the entertainment controller. And lastly, directly to the side of your seat is yet another panel that houses a small storage space, as well as the headphone jack and USB outlet. This arrangement allows you to secure your USB devices in the storage department while they charge. The amount of storage room is hugely gratifying, since you can ensure that all your knick-knacks are secured in place during the flight. On the other hand, there’s also the considerable risk of forgetting to check the compartments when you disembark and leaving items behind. Unfortunately, this happened to Jessica with some expensive face creams we had bought on our trip. Don’t let it happen to you! Meanwhile, with the side panels closed and latched, you have ample surface space to put a drink, a snack, or various loose items. The benefit of being in the window seats is that you can even use the air vents located between your suite and the fuselage as additional surface space! 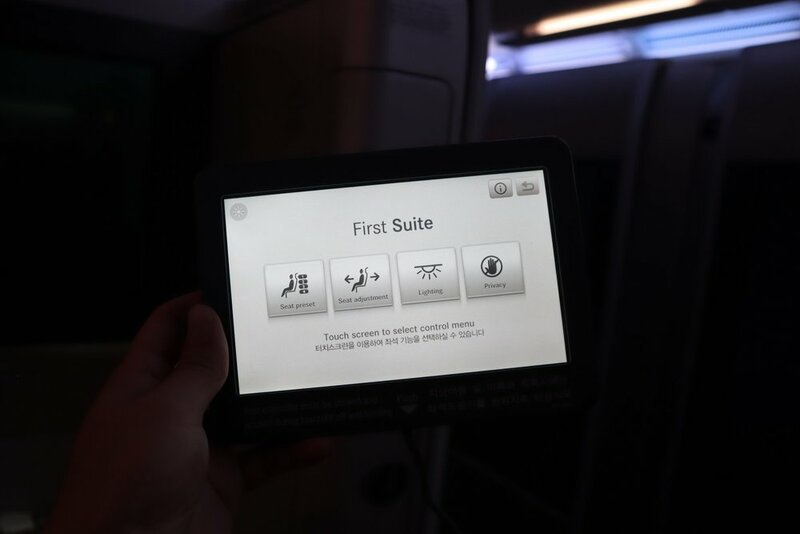 Onto the other side of the suite, where the inner wall is adorned with a reading light, a literature pocket, and – my favourite feature of the suite – a handheld tablet that’s used for controlling the seat position, lighting, and privacy. I had just about enough time to finish up the tour of my little home for the next eleven hours, before the flight attendant approached me and offered a welcome drink. In keeping with the First Class spirit, I naturally opted for a glass of the Laurent Perrier Brut, which was served with mixed nuts. Boarding was just about completed by this point, with maybe two-thirds of the First Class cabin occupied by passengers. One of the passengers sitting along the middle seats was travelling with her young daughter in the suite next to her, although thankfully she was well-behaved throughout the flight. Around this time, the flight attendant came around to ask what sized pajamas I would prefer – I chose a Medium. She also handed me the in-flight menu and wine list. As the doors closed and we began our pushback from the gate, I also took this opportunity to check out the various other items that had been left at my seat. 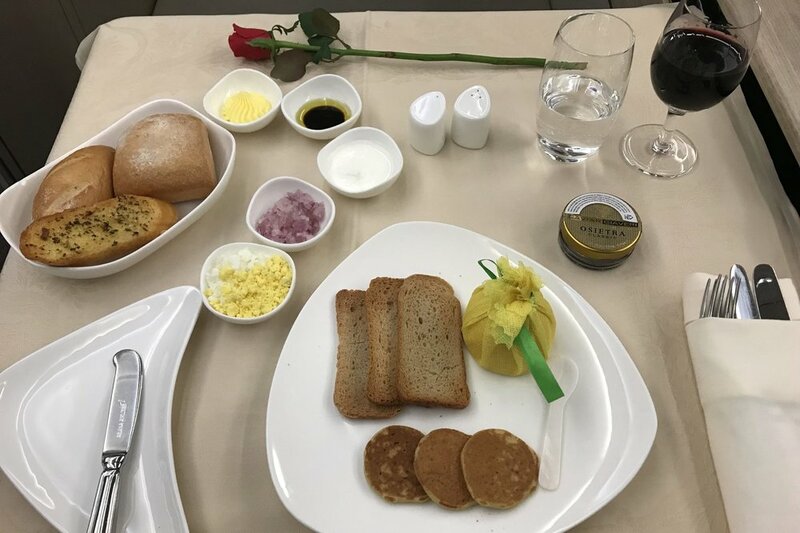 Asiana’s pre-departure service principle seems to be relatively hands-off, since many other airlines would have their crew hand-deliver these items to First Class passengers, instead of placing them at the seat before passengers boarded. There was a set of slippers, which I changed into shortly after the flight began. We also had Bose noise-cancelling headphones, which I didn’t end up using throughout the flight, although Jessica seemed quite satisfied with them when she watched a movie or two. Then there was the Salvatore Ferragamo-branded amenity kit. The fabric felt very high-quality to the touch, and the contents were impressive as well. The highlights of the amenity kit were of course the wealth of skincare items by Tuscan Soul, the line of perfumes and fragrances by Salvatore Ferragamo. In addition to the usual hand cream, lotion, and lip balm, there was also facial mist, cologne, and an aftershave emulsion. Naturally, as I do with most of these high-end amenity kits, I packed it away in my backpack for future use. As we continued our taxi, the cabin lighting was dimmed, and the safety video was displayed on our entertainment screens. Soon after that, we began our long takeoff roll, with the sheer size of the Airbus A380 feeling quite palpable as we rumbled airborne into the Seoul night. I hadn’t gotten a chance to fully explore the handheld LED tablet earlier, so I did so as we climbed to cruising altitude. The default screen allows you to choose between Seat Preset, Seat Adjustment, Lighting, and Privacy. The Seat Preset screen allows you to choose between the upright position, “dining mode” (which as far as I can tell is simply the upright position with a slight recline), recliner mode, and lie-flat mode. Helpfully, the LED screen displays a graphic of the seat position as well. Seat Adjustment allows you to fine-tune your seat position to your exact liking. You can adjust such factors as the seat pitch, headrest height, and back cushion stiffness in order to maximize your comfort. The next screen lets you pick between full lighting for reading or working purposes, some simple mood lighting, or no light at all. Lastly, you can choose whether to turn on “Privacy”, which is a small light on the exterior of your suite that lets the crew know if you’d prefer not to be disturbed. Again, this doesn’t actually close the doors of your suite though – you’d have to slide them shut manually. I also explored the “OZ:enter” entertainment system using the controller on my left-hand side, just to get a sense of the titles that were available. The Hollywood movie selection was pretty varied, while the television shows were more limited, with only a few titles each with several episodes. If you’ve read my other reviews, you know that I rarely actually use in-flight entertainment systems; instead, I like to put on the airshow and watch the flight go by. In that respect, Asiana is in my good books, since it offers a comprehensive airshow software with a multitude of viewpoints. It was about 30 minutes after the seat-belt sign turned off that the cabin lights flickered back to life, signalling the start of the meal service. As the crew came by to take meal orders, Jessica and I coordinated our requests – she’d get the Korean dinner with some white wine to drink, while I’d go with the Western menu with a glass of the Spanish red, and we’d try to have everything to share. In that spirit, we communicated to the crew our desire to enjoy the meal together by making full use of the buddy seat and dining face-to-face, but it turns out that there were some logistical difficulties we hadn’t anticipated. Basically, the Korean menu is served on one huge tray that’s almost the size of the entire table itself, so we wouldn’t be able to fit both of our meals on the same tray table. Nevertheless, since the middle seats adjacent to me (Seats 3E and 3F) were sitting empty this flight, the crew generously offered to have me and Jessica take up those seats for our meal, so that we could eat side-by-side. So although it worked out this time, that’s something to keep in mind if you’re flying Asiana Airlines First Class: although the ottoman in the suite can serve as a buddy seat, you might not be able to fit both people’s dinners on one tray table if you order the Korean dinner! I hopped over to Seat 3E, and Jessica went around the galley to settle into Seat 3F adjacent to me. I definitely recognized the advantages of these central seats for couples travelling together: you get to talk to each other much more easily, you can watch the same shows on TV, etc. And on the off-chance that you find yourself seated here next to a stranger, there’s a privacy partition that can be raised. The crew proceeded to set our tables, and the Western and Korean dinners began at roughly the same pace. Since we intended to share everything, Jessica and I had no compunction about passing our food to each other across the central divide (mostly from her to me). My Western meal began with a tasty amuse bouche, a mozzarella-and-cherry-tomato skewer. The caviar course was next, and the crew painstakingly set my table with all the plates and ramekins before topping it all off with a rose. It’s small touches like these that truly distinguish a First Class experience. The caviar that was served was a Russian variety, which had a balanced taste to it. It was served with biscuits and blinis, as well as lemon juice, chopped egg yolks and egg whites, chopped onions, and sour cream as accompaniments. 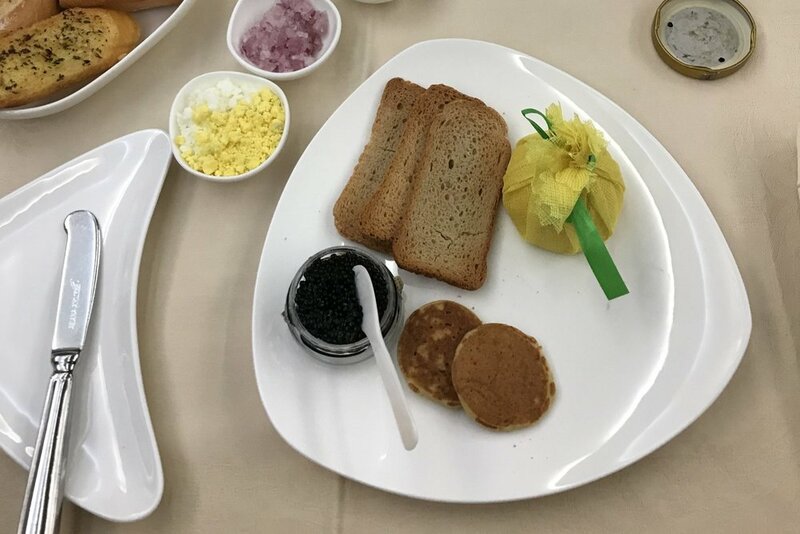 I recently learned that caviar is best eaten with a mother-of-pearl spoon (as seen in the picture), since metal spoons can chemically alter the taste of the sturgeon roe. Who knew?! Over on Jessica’s table, her Korean starter, the gujeol-pan (or the “platter of nine delicacies”) was served. This elaborate Korean dish is meant to be eaten by wrapping the various veggies and meats in the central stack of rice paper. Suffice to say that we had lots of fun with it! The crew member serving Jessica also asked her if she’d like to try some of the pumpkin porridge, even though it’s actually listed as an alternative starter choice to the gujeol-pan. She accepted, although it turned out to be “just fine”. My Western dinner continued at a good pace. Next up was the appetizer, for which I chose the salmon tartare with salmon roe. I love seafood of all kinds, so while the dish might seem like an overload of salmon, I happily guzzled it up. The soup course was next: a simple tomato consommé. The taste was light, although the dish was perhaps a little too simple for a First Class meal, I thought. That was followed by a lemon sorbet as a palate cleanser, which I found to be an interesting touch – I haven’t experienced this particular fine-dining ritual before! The crew was exceptionally hard-working throughout the meal, coming by every minute or so to check if I had finished the course I was working on, or if my wine needed topping-up. With so many courses to the Western meal in particular, they had to be on top of their game, and they were. However, while the crew demonstrated incredible attentiveness, I felt they also could’ve shown more… warmth, if that makes sense. After all, now that I’ve flown a few First Class airlines, I’m starting to compare notes between them, and I found that some of the other Asian carriers (like Japan Airlines or Cathay Pacific) delivered service quite enthusiastically, whereas the Asiana crew were a little more reserved. Of course, that’s not necessarily a bad thing either, depending on your preference. Anyway, one glass of wine later, it came time to serve up the main courses. Let’s begin with the Korean side – while it has fewer appetizer courses compared to the Western menu, the Korean dinner makes up for that with a staggering bibimbap main course offering. I mean, don’t get me wrong, bibimbap – assorted mixed meat and vegetables with rice and red pepper paste – is pretty standard fare at the Korean restaurant just down the street from me, so the dish itself isn’t necessarily worth raving about. But the sheer novelty of mixing your bibimbap and digging in at 37,000 feet in the air, together with the usual side dishes that you’d find served in a Korean restaurant – I gotta say, that was pretty special. As for me, I had picked the grilled beef tenderloin with red wine sauce as my main course. It was a tasty cut of beef – certainly less juicy and tender than what I’d get on the ground, but that’s somewhat to be expected, and the delightful sauce did help to mitigate that. I’m not the biggest fan of asparagus or mushrooms, so I left the vegetables on the side untouched. If you’re familiar with my other reviews, you’ll know that it wouldn’t be a First Class flight for me without a healthy amount of overeating. So while Jessica wisely eased up on the food after half of her bibimbap, I forged ahead and finished the rest, along with her side dish of mixed abalone and chicken for good measure. …and struggled earnestly against the chocolate fondant cake I had chosen for dessert (apologies for the awkward image on this one). 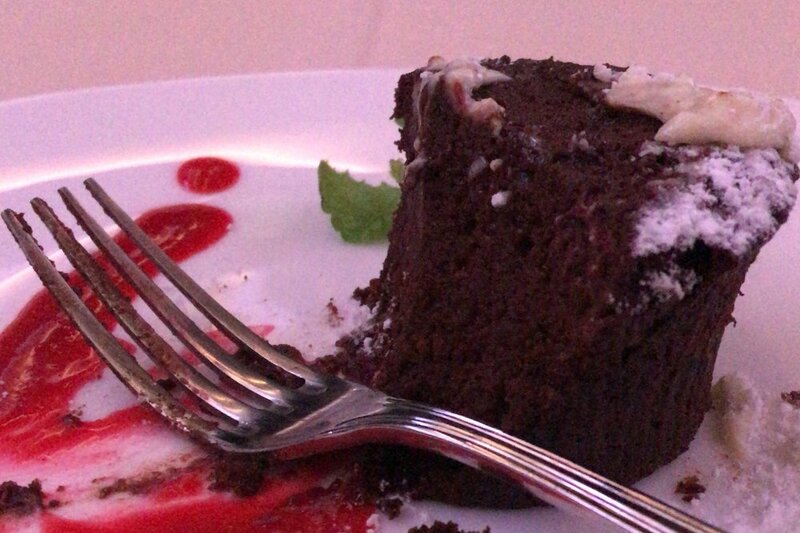 Across the aisle, Jessica had opted – again, wisely – to skip over dessert entirely. Overall, I thought the meal was excellent, and (for the most part) well worthy of a First Class dinner. The ingredients tasted fresh, the presentation was delightful, and getting to eat bibimbap on a plane was certainly a novelty. Nevertheless, there’s definitely room for the meal to make even more of an impression on First Class passengers, and I didn’t feel dazzled by the food the same way that, say, Japan Airlines First Class made me feel. With a little more creativity in some of the dishes, Asiana can yet improve their in-flight meal service to make it a truly memorable one. The dinner service came to an end as we were flying over Russia’s Sakhalin Island. As our plates were cleared away, the flight attendant asked if she should prepare my bed for sleep, and I gave her my blessing to do so. A bathroom break was much-needed after a meal like that, and I headed over to the First Class bathroom on the right side of the cabin to freshen up and change into my pajamas. The Airbus A380 has two bathrooms in First Class, with the right-side unit being much more spacious. The bathroom consists of a large bench, which can be raised to reveal the toilet seat, and lowered to become a spacious area for changing clothes and sitting down. There’s even enough room for a window in the bathroom, which is something you only see on certain types of aircraft. The medium-sized pajamas ended up fitting me snugly but comfortably, and I brought them with me after the flight and still wear them around the house to this day – that’s the mark of good airline pajamas! Meanwhile, the other First Class bathroom on the left side of the cabin is much smaller, akin to the standard airplane bathrooms on just about any aircraft. There wasn’t much else to see in the galleys, although I did get to walk by the majestic staircase that provides access to the A380’s upper level. I’ll have to try Asiana’s business class up there someday. Returning to my seat, I discovered that it had already been made into a bed for me – the pillow, blanket, and mattress pad had been brought out and fashioned into a comfortable sleeping surface. I have to say, despite the rather drab colours of the seat upholstery, with the main cabin lights off and the mood lighting setting the scene, the Asiana Airlines First Class suite looks very stylish indeed. Before going to bed, I stayed in Seat 3E to get some work done on my laptop. Unfortunately, Asiana doesn’t offer wifi on their Airbus A380 aircraft, as only their A350s feature any sort of connectivity. And thanks to our delayed departure from Seoul and the incredibly filling meal I just ate, I grew tired rather quickly, so I decided to catch some sleep pretty soon. As I usually do on First Class flights, I popped by the galley to ask the flight attendant to wake me in four hours, since I didn’t want to miss out on too much of the First Class experience. With that, I checked up on Jessica (who was fast asleep already), shut the doors to my enclosed suite, and tucked myself in for the night. Happily, the “starry night” lighting on the cabin ceiling put me to sleep in no time. Four hours of comfortable sleep later, my flight attendant dutifully woke me up, but I snoozed for an extra half-hour, until we were just about passing over Alaska. To perk myself up, I ordered some extra spicy ramen noodles and some sweet pineapple juice, which hit the spot just right. Incidentally, Asiana also offers Korean cold noodles on their snack menu, and I’m quite sad I never got around to trying it, since it’s actually one of my favourite Korean dishes. I drifted in and out of sleep for the next little while, since my body was still very much on Asia time. Before long, it came time for the pre-arrival meal, and I chose the Korean option this time, with some orange juice to drink. Like the bibimbap from earlier, my ginseng porridge and accompanying side dishes were served on one huge tray. Ostensibly this was supposed to be breakfast, and the warm and soothing ginseng porridge was perfect for that purpose. Among the side dishes, the cod roe was my favourite, giving the porridge a strong flavour boost when mixed in. A plate of fresh fruit brought the in-flight dining experience to a conclusion, and I also ordered a cup of Earl Grey to sip on as the flight reached its tail end. As the captain announced that we were beginning our descent into Los Angeles, a series of rather interesting end-of-flight videos began playing on the entertainment monitor. First, a request for donations that passengers could make using an envelope in their literature pocket, followed by several minutes’ worth of in-flight exercise videos. I felt as though I could stretch my legs a bit, and so gladly participated. Eventually, we touched down at LAX in the smoothest fashion, bringing our journey on Asiana Airlines First Class to an end. Reluctant as we were to leave our private enclosed suites behind, we enjoyed the privilege of deplaning before everyone else as First Class passengers, although crucially forgetting to check all the storage compartments for our belongings on our way out! Asiana Airlines First Class is an amazing way to travel. The individual enclosed suites represent a fantastic hard product, while the food and service also earn very high marks for their quality. With generous award availability on their A380 routes from Seoul to Los Angeles and New York JFK, it’s a product that I’d recommend you try at least once. Nevertheless, when compared against the highest echelons of First Class luxury out there, I’d say Asiana still ranks one level below, mainly on the soft product and especially once you factor in the rather disappointing First Class ground experience in Seoul. I certainly hope to see Asiana make that step up in the future, but for now, I’d be much more eager to fly Japan Airlines or Cathay Pacific across the Pacific among the airlines I’ve already tried.